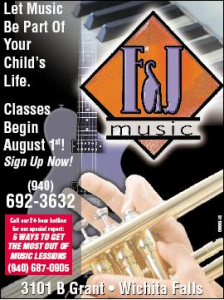 F&J Music offers a well rounded music program on most instruments and voice. We have qualified instructors who are all experienced teachers and performers. All lessons are private one-on-one instructions with the class tailored to the needs of the student. We strive to help our students become the best they can be, not only in their music education, but also help to make them successful in their school music programs. We have a flexible schedule and instructors of different teaching styles and personalities. All our instructors use published lesson materials so the learning process is well organized and progressive. We offer two recitals per school year for those students to participate. All are welcome to participate, and we invite friends and family to enjoy the performances of all of our students. All lessons are one half hour per week (same day and time each week). Tuition is based on a four-lesson month. Tuition is arranged on a monthly auto debit system. You may start any time and you may stop anytime. All we ask is that you give us 30 days notice before you discontinue. For students starting in the middle of the month tuition will be pro rated. Lesson books will be purchased during the first lesson. As your student completes books, we will have the next level available for purchase. Students are expected to attend all lessons. Make up lessons are provided for extreme illness as long as 24 hours notice has been provided. We ask that you keep the same date and time throughout the year. If you need to change your time, please speak with your teacher.